intro: Good luck finding a proclamation. But that's no reason to let a perfectly respectable nickname go unheralded on its day in the spotlight. 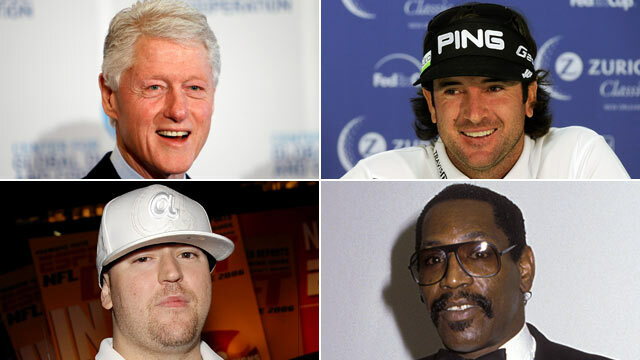 So, in recognition of Saturday's National Bubba Day, behold these 10 famous Bubbas. quicklist: 1 category: National Bubba Day title: William 'Bubba' Clinton text: "Bubba" means different things to different people, but "42nd president of the United States" is definition enough in this case. Clinton is 65.
quicklist: 2 category: National Bubba Day title: Gerry 'Bubba' Watson Jr. text: Underdog golfer Watson, 33 -- and a lefty, no less -- rekindled "Bubba' fever this year with a nail-biting, sudden-death playoff win at the Masters Tournament, his first major title. quicklist: 3 category: National Bubba Day title: Charles 'Bubba' Smith text: Before landing acting roles such as Moses Hightower in the "Police Academy" movies, Smith, 66, welcomed fans' chants to "Kill, Bubba, Kill" as a dominating defensive lineman in college and the NFL. text: The former major league outfielder, 35, once told ESPN that his efforts to shake the "Bubba" moniker failed miserably as a boy in Texas. "I tried to change it in school, call myself Richard, but kids would call for me and ask for Richard, and my parents would burst out laughing and say, 'You mean Bubba?'" quicklist: 5 category: National Bubba Day title: Bubba Sparxxx text: Georgia rapper Warren Mathis, 35, came up with the stage name because "in the rural South," he told the Associated Press, "'Bubba' is like how people say 'dude' in California. It's a name for a regular Southern man. I know a Chinese Bubba, a black Bubba." quicklist: 6 category: National Bubba Day title: Tommy 'Bubba' Facenda text: The rockabilly singer-dancer from Portsmouth, Va., 72, wore his Bubbaness so comfortably that "Bubba Ditty" is among his singles, the best known of which is "High School U.S.A."
quicklist: 7 category: National Bubba Day title: William 'Bubba' Paris text: The motivational speaker, 51, who once laid down 6-foot-6-inches, 300-plus pounds of "Bubba" Sunday after Sunday as an NFL lineman, counts three Super Bowl rings from his years with the San Francisco 49ers. quicklist: 8 category: National Bubba Day title: James 'Bubba' Stewart Jr. text: The professional motocross rider, 26, put his "Bubba" to good use with a reality-TV show called "Bubba's World" that ran for two seasons through February. He has 44 Supercross victories. quicklist: 9 category: National Bubba Day title: Bubba the Love Sponge Clem text: Born Todd Clem but now legally Bubba the Love Sponge Clem and host of the radio show that bears his name, Clem, 46, absorbs controversy as well as anyone (witness the on-air hog slaughtering in 2001 that sent the FCC into a tizzy). quicklist: 10 category: National Bubba Day title: Daniel 'Bubba' Franks text: The three-time NFL Pro-Bowl tight end, 34, has a collection of memorable one-hand catches on his resume.